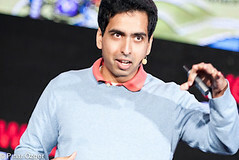 Khan Academy now has three million unique viewers each month. Florida Governor Jeb Bush and North Carolina Governor Jim Hunt hosted a conference earlier this month called The Future of State Universities. They gathered some top education thinkers to talk about how to improve public universities. Salman Kahn was on hand to discuss what he’s doing with Google and Bill Gates’ funding. Videos were just a prelude. South Dakota Public Universities See Enrollment Jump For Online Courses: An Export Industry?